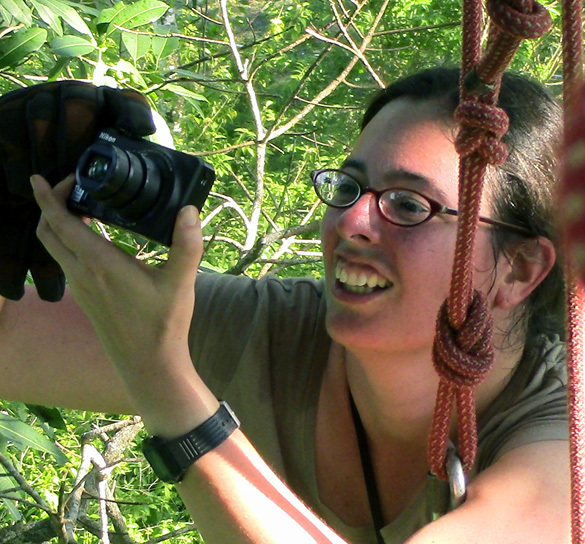 I have taught and mentored in the classroom and in the field covering topics in primatology, bioacoustics, parasitology, and primatological field methods. As a teacher and mentor, my goal is to provide students with the theoretical background and methodological tools to pursue the questions that excite them, both within and beyond the classroom. I provide my students with opportunities to explore, identify, and answer the questions that they themselves are passionate about. Through developing their own field projects, my students draw upon course material and grow as independent-thinking researchers. I am interested in the role of disease in the evolution of primate sociality, communication, and cognition. I use a diverse tool set that includes health data, bioacoustics, behavior, and cognitive experiments on wild, free-ranging primates. I have spent more than two years in the field including sites in Madagascar and Costa Rica. I have researched diverse primate species including multiple species of mouse lemurs, two species of galagos, and capuchin monkeys. Accepted Kessler SE. Capture-recapture. In Fuentes, A et al. (eds. ), The International Encyclopedia of Primatology. Wiley-Blackwell. In press Kessler SE, Radespiel U, Schaber K, Strube C. Tiny Samples from Tiny Lemurs: Methodological Considerations for Endoparasite Analyses in Mouse Lemurs. In Lehman SM, Radespiel U, Zimmermann E (eds. ), Dwarf and Mouse Lemurs of Madagascar: Biology, Behavior and Conservation Biogeography of the Cheirogaleidae, Cambridge University Press. In press Kessler SE, Radespiel U, Nash LT, Zimmermann E. Modeling the origins of primate sociality: Social flexibility and kinship in mouse lemurs (Microcebus spp.). In Lehman SM, Radespiel U, Zimmermann E (eds. ), Dwarf and Mouse Lemurs of Madagascar: Biology, Behavior and Conservation Biogeography of the Cheirogaleidae, Cambridge University Press. 2015 Kessler SE, Scheumann M, Hanbury DB, Nash LT, Zimmermann E, Watson SL. Screams in the night: Moderate evidence for individual differences in lorisiod vocalizations. International Journal of Primatology. Online First. 2015 Radespiel U, Schaber K, Kessler SE, Schaarschmidt F, Strube C. Variations in the excretion patterns of helminth eggs in two sympatric mouse lemur species (Microcebus murinus and M. ravelobensis) in northwestern Madagascar. Parasitology Research, 144(3): 941-954. 2014 Kessler SE, Radespiel, U, Hasiniaina A, Leliveld L, Nash LT, Zimmermann E, Radespiel U. Modeling the origins of mammalian sociality: Moderate evidence for matrilineal signatures in mouse lemur vocalizations. Frontiers in Zoology, 11:14. 2012 Kessler SE, Scheumann M, Nash LT, Zimmermann E. Paternal kin recognition in the high frequency/ultrasonic range in a solitary foraging mammal. BMC Ecology. 12: 26. 2010 Kessler SE and Nash LT. Grandmothering in captive Galago senegalensis braccatus (Senegal galago) African Primates, 7(1) 42-49.